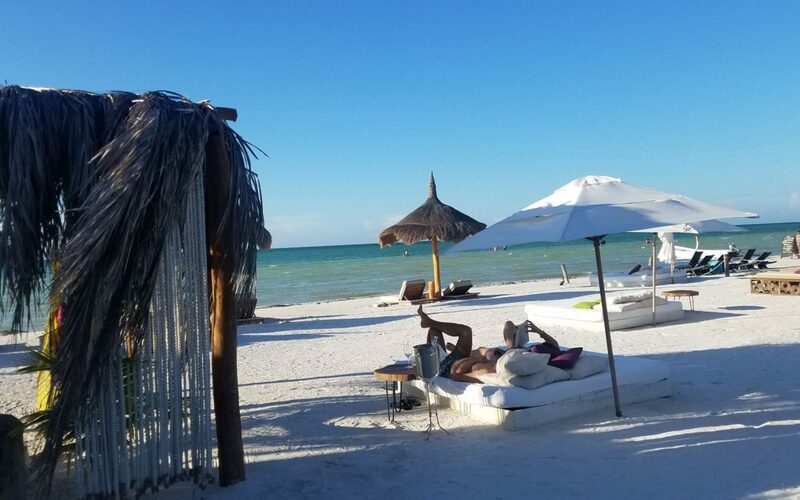 Shh … Isla Holbox, called the anti-Cancún, is one of those special places you’re torn between wanting everyone and no one to know about. Arriving in Cancún, I rented a car. Driving two hours northwest, via modern highway then a slower road through Mayan towns such as Kantunilkin, I arrived at the end of the road in Chiquilá where a 35-minute ferry-ride takes you to Holbox. Most people come to Holbox to swim with whale sharks May – mid September, but year-round you’ll find those who know about this little paradise just kicking back and slowing down. No cars on Holbox; only walking, bicycle or golf-cart taxis. The few roads are of hard-packed sand. Envision white sand beach, miles of shallow turquoise waters and palm trees. And no seaweed problems. 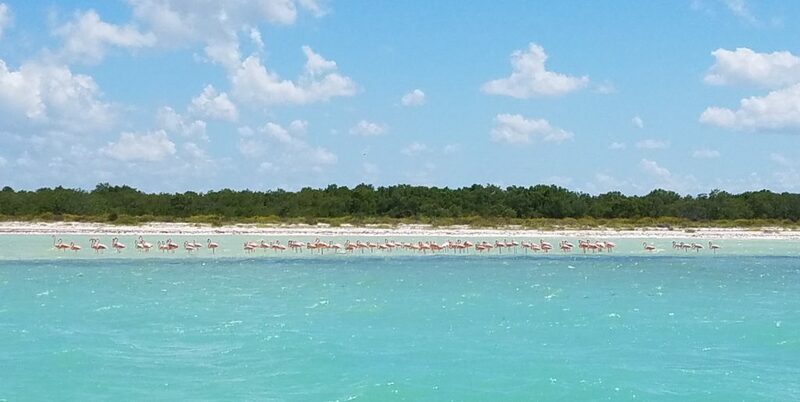 The highlight was motoring over to a remote area with long lines of pink flamingos feeding on crustaceans along a stretch of sand bar. Environmental regulations prevent you from getting too close. We switched off the engine and, gently bobbing in the ocean, took in the mesmerizing scene. Everyone was silent in awe. It was pure heaven late in the afternoon to swim and just hang out in the warm shallow water, like a grown-up’s kiddie pool, watching birds pass by and reveling in the beauty and serenity. Nestled into a lounge chair the size of a bed under a palapa (thatched open-air structure), I connected to the zen of a perfect blushing sunset bidding its adieu. Backpackers stay in hostels in town, which is a tad “boho,” but very safe, and those who want peace and quiet stay a mere-10-minute walk outside town in the few small upscale boutique hotels such as the Ser CasaSandra where I stayed. The 24 rooms are white with design accents taken from the local culture. The common areas are tasteful, chic and the food excellent (breakfast is included in the rate). The staff could not have been nicer and service is top notch. My spacious room was very comfortable, especially the bed and linens rivaling those of the finest hotels. Another up-scale, yet relaxed, hotel I’d recommend, a bit further out of town, right on the water, is Las Nubes for a real feeling of away from it all. Both CasaSandra and Las Nubes have multi-room villas for families. The island has strict environmental rules and sustainability is practiced, not just a PR gimmick. No plastic straws, development is limited and regulated, waste is carefully treated, and the products provided in my room included organic insect spray and sun lotion made without harmful chemicals. Water sports abound including paddle boards, sea kayaks and kite surfing. Another treat on dark nights is viewing ocean bio luminescence–like a watery psychedelic trip. But just slowing down is the most common pastime. My last morning, I headed out early by bike, before most visitors had risen, and rode on the beach and into the town’s outskirts where little guesthouses are scattered amid the nature, watching life in Holbox get underway. So many minuscule worlds to explore but all very chill and peaceful in this charming town that slows you down and lets you connect to the moment and your surroundings. To find out more about Isla Holbox or to book your stay, contact me now!